Each week I try to analyse 1 of my matches to improve as fast as I can. This week it’s me (Maca) vs Aussie Rob who is the best player on the Gold Coast. Hey guys. Ryan here from melee.co. In this episode I’m going to analyse one of my matches from last Tuesday night. 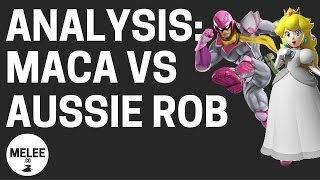 This is a match of me, Maca the peach player against Aussi Rob who is the best falcon player or the best player on the Gold Coast. It’s the best of three sets. I lose two nil which is to be expected. But hopefully we can learn something from this. This was the only match from the bracket that I actually got on stream so I want to analyse this one even though it’s just so unevenly match and I want to try and learn at least one thing that I can take away from this in order to become a better player. There are two good captain Falcons on the Gold Coast – there is Aussie Rob and there is Nico. Obviously if I want to be good I need to get good at this match up because these are the two best guys on the Gold Coast. I need to get better at this match up, better analysing them and see what I can do better. So let’s start by watching. We strike to dreamland because you know dreamland can be good for space. It’s also good for falconing because you have so much room to run around. So it’s like basically a throw between either dreamland or battlefield. We ended up on dreamland and we’ll see how it goes. I start as an aggressor. Now, one of the things that I learnt about this match up from watching ‘Zero To Hero’ with Tafo is that Captain Falcon just has so much range in terms of his dash turns and in terms of short hop neutral air and stuff like that. So it is something like he can almost carry across the entire stage like in one attack with like if he’s running and then does a neutral air it could just get me almost across the entire stage. And so Falcon loves to be able to run around because then he’s unpredictable. And so one of the ways I guess to be Captain Falcon is to be able to mitigate that and try and trap him, force him into a position where he’s not running. This is actually my second time watching it because I tried to record it and forgot I wasn’t recording. There we can see – I’m getting punished a lot, whiffing a lot, just a bit late on some things. Oh, you can see I get down by a forward smash there. A dodge was a bit too early I think. I’m trying a lot of mispaced – oh another one – 35% – I’ve already loss two stats. I’m getting a lot of mispaced down smashes. So I just need to be careful here, be more conservative with that. We see he’s in a corner now – he is cornered around. What does he do? He shields. And we’ll see this again in the same match as something that is good. So I need to work out – like people talk about peach walls – I’m still not 100% sure what they’re talking about. But you know, getting him into the corner or getting him wedge there does seem to be a good thing to do. So we get the back air there. Oh no, no, I just get stomp, so I need to be careful with that. I think I float too early, probably shouldn’t float so much right near the edge when he’s coming back. So I can just see he has so many options on the edge, especially when they’re not really far and you know they can only go back to the ledge. Again, probably floating prematurely, I am noticing as I go through this. Like I will float and he kind of hold back not really throwing anything out. I wonder if he’s waiting for me to whiff. There are a lot of opportunities for me here actually. Because, like I’m threatening here with my back airs – not there – where is it? And like he’s throwing out these neutral air whiffs which we can see here so he’s threatening as well but there’s opportunity for me if I can react faster to see that he’s doing that and then come in and do something. So there’s another one there. Could I come in with a back air? Get a lucky down smash there – another one – a back air. And things like that, those neutraliser should be able to wave dash back to avoid situations like this where I’m off the edge, he’s off the edge. I wish I could do something like try to back air or something to improve the situation. At this point, looking like I’m going to get four stats but I don’t actually get four stats to this match. Ah, look how far he got me from. I’m coming down and he gets me like from all the way across the stage. So I don’t know why what happens here. Okay, so he goes for the ledge which is probably smart. I think I would have gone for the ledge if he didn’t – get in there – did I do anything good? No. I need to learn how to L-cancel there – those ones- because that happens occasionally, you want to throw something to protect yourself off the edge. And rarely do I L-cancel. So that was me trying to pull a turnip which I missed. Oh, I’m very happy with that. That in so float near was good and I also was about to go for the grab there. I stuffed up – what do you call it – a wave length. Alright, so I’m going to do a dash attack but obviously it doesn’t do much and I didn’t get punished for it. So dash attacks I need to do closer and not from such a far range. I need to be less desperate to get a hitting and be able to take my time and choose the right time when I’m in the right spot, trying which sort of situation when I was walling him out a bit. Look again, he’s in this situation and he shielded and I was able to get a punish. Follow-up, take chase – or follow it up again, but you know, it’s a bit too early with our dash attack. Jumping over, fuelling my dash tanks – luckily I theft there. I wonder if I get another [5:59 inaudible] if he will trade ___ me? I can’t remember. So I get in with an air – again, he’s jumping over my dash attacks. Something that I’ve taught about many times is the need to dash attack less – it’s my worst habit I think. So he goes for the knee and misses. He’s getting ambitious here. I grab the ledge. I should have stayed on the ledge. Why did I not stay on the ledge there? Oh, again jumped over, dash attack, punished for it. Oh, I get lucky there – please grab the ledge. Yes, grab the ledge there. Okay, this match isn’t working too bad now. At least it’s down to two stats. At one point, it looked like I was getting it four stats. It’s how I had to learn when someone so much better than you – it’s like, “okay, well I’m getting destroyed by everything he does. Mispace down smash, mispaced down smash, early dash attack which gets punished. So I guess the two things that I’m taking away are like mispace down smashes. So I’m too eager to do those – just hoping for the easy down smash which I never get against Rob. He knows too well. Rob and Nico always punish that and then the dash attacks. You know, I’m doing them too early. I need to pick my times when I do them. And then also using I guess the threat of the back air and trying to get him in a position where he feels stuck. It’s kind of my three takeaways so far. Falcon because I just get grabbed. There again – this is the third time this has happened and I don’t know if this is one of Rob’s habits or if it’s just obviously he’s expecting another dash attack. But he’s in the corner and he’s shielding. And so you know that’s not going to happen every time obviously but luckily those three times that he did that I was able to get a grab in which is good. I obviously need to improve my edge guards against Falcon. He was saying that down smash or down air on the end can be good. So maybe I need to look at that but that’s pretty hard to do I think. I grab the ledge – please grab the ledge – thank goodness. All right, back to even stats. I still got no chance of winning but that’s alright. I’m going to try hard, let’s never give up. Oh, another mismatch down smash – go for a grab – oh no, no dash attack – oh, and he stomps on my head. Oh, I almost follow through. Oh yes, another one, oh, he gets out of it. Oh and there’s another mispace dash attack, mispaced down smash, more back airs, need more back airs, come on Ryan. There we go – trying for a back air and ended up on the platform. Oh, mispaced, dash attack again. Oh, just bad knowledge of my spacing really, like I don’t know where my spacing is or what I need do with the spacing. Probably I could down smash there because invincibility is right next to me. Oh, I feel lucky to get that in. Oh, please follow up, please, please do something. Yes, that feels like dumb luck – feel like I should have done a down air or something there. I don’t know how that neutrally hit. Okay, I try to down smash with the turnip – so careful of that grab – yes straight behind, grab the ledge, grab the ledge. He could have got back in even if I grab the ledge but at least I would have limited his options. Maybe I shouldn’t grab the ledge and I should have just regain stage control because so early in the game I’m not going to get a gimp against him – he is too good. Back air, come on – ah, what was that? What was that? I tried for the up air – at least I tried for the up air – something that I need to do more is more up airs. Look, did you see – that was dumb – look at this – look at that back air -what was that? Then he just knows I’m in lag. Watch this – watch this – so bad. Ready? Look at that – oh no and then I’m in lag. No, no Ryan. Oh, gone, gone skies. Do I get him down to one stat? Or does he finish it on two? Let’s see. Poor turnip. I regain the centre but obviously he can just run around me. Tried to back air but wasn’t moving fast enough – grab, grab, grab – oh, should’ve followed through with a grab against him. Then I could have potentially got stomped on the down smash. I dash attack and then when I go straight out go for a grab. Oh he rolled on the way this time – didn’t just shield. So there we go. I will grab the ledge, fast full to ledge, come on Ryan go compete with him on the ledge. Oh no, no, he still has two stumps against me – and there it is. And that’s Nico in the middle there, he’s one of the good falcon player. So they follow up after this. What I learned from this? I learned that I do a lot of mispaced down smashes that are getting punished. I do a lot of mispaced dash attacks that are getting punished either like he’s jumping over me or I’m doing them too early, and then he’s coming in and punishing me. I also learnt that I need to use the peach wall back airs or a thread of back airs to kind of corner him and make him feel like he can’t move. But I need to get better reacting to him as well and when I am in that position and I am threatening out of back air that I could actually hit him because I feel like he’s being cautious because it could connect but he was throwing out those neutral air which after he whiffed I could have gone in with a back air but I just didn’t have the reaction time for that. So I guess that it is three things that I learnt: Try and get him the corner using back airs; stop doing so many damn smashes that are completely mispaced; and be careful with my dash attacks. These therefore are the learnings from this week. I am hosting the first paid tournament on a Tuesday night on the Gold Coast next week so let’s see how that goes. A few people are probably coming down from Brisbane but the main guy, like the best guy in Queensland I don’t think he’s coming as a few other people who aren’t going to make the trip, but that’s fine. Look, if it is only three or four people there, I don’t care. I am going to hold the tournament. I am going to build up the Gold Coast seeing that I want to add to this community and so that’s what these videos are for – hosting tournaments, doing this stream, putting up these recordings and so on. I want to build the Gold Coast Community in terms of smash and I want to get better and I want to help everyone else get better. I love this game. I love the community. I hope that this was interesting to you. It was interesting to me to watch. It’s not the best game to analyse because I was just so outsmarted by him. He is so much better than me but at least I got a few takeaways from it. Hopefully next time I play him I can be more careful by my dash attacks and down smashes. And hopefully I can keep practicing my wave dashes and be able to wave dash back making my movement more or less predictable and then hopefully I can get him into more situations where he was shooting, you know, on the edge there or something like that. So, we’ll see how it goes. Until next time, keep smashing. Thanks for watching and I’ll see you in the next episode.